Friday night I made strawberry shortcake for a little dinner party. Again, I forgot to take pictures! Later we finished up the shortcakes and whipped cream with canned peaches and I can tell you that it just isn't the same. 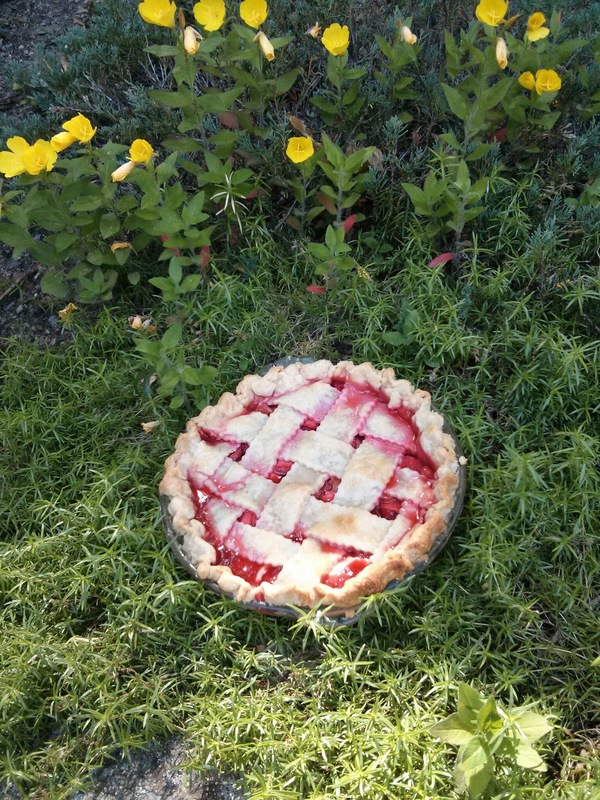 Yesterday morning I made a strawberry rhubarb pie. I finally had an opportunity to use the leaf lard I'd been given for Christmas. I had remembered to thaw the lard for a few days in the fridge so it was easy to work with. I used the same proportions as I would have with shortening: 3 cups flour, 1 tsp. salt, 1 cup plus 2 tbsp. of lard, and 6 tsp. water. The filling was 1 quart strawberries and 12 oz. frozen rhubarb (the latter squeezed to remove the extra liquid), 1 cup sugar and 1/4 cup cornstarch. Super simple! I brought the pie to my parents' house where everyone raved about that crust. It was pretty amazing. So so so worth it!